About Us > NCLR Staff & Board > Alexander L. Chen, Esq. 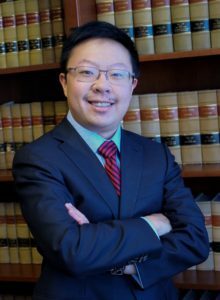 Alexander Chen is a nationally-recognized transgender civil rights attorney who is currently an Equal Justice Works Fellow (sponsored by Salesforce.org and Baker McKenzie) at the National Center for Lesbian Rights, one of the nation’s leading LGBT advocacy organizations. Alexander is also a Lecturer-in-Law at Harvard Law School, where he teaches the Law School’s inaugural course on Gender Identity and the Law. At NCLR, Alexander’s work focuses on expanding the rights of transgender people through litigation and policy advocacy in education, employment, health care, housing, prisons, and juvenile justice and child welfare settings. Alexander is a member of the legal team litigating the transgender military cases Doe v. Trump and Stockman v. Trump. He also co-drafted AB 2119, a bill making California the first state to guarantee access to transition-related health care for trans youth in foster care. Alexander has received numerous awards for his work, including being named one of Forbes’ 30 Under 30 in Law and Policy, and one of the 40 Best LGBT Lawyers Under 40 by the National LGBT Bar Association. Alexander received his B.A. from Oxford University, his M.A. from Columbia University, and his J.D. from Harvard Law School, where he was the first openly transgender editor of the Harvard Law Review and worked on trans issues at the Department of Justice, the ACLU LGBT Rights Project, and the National Center for Transgender Equality. He clerked on the Ninth Circuit for the Hon. M. Margaret McKeown, and in the Southern District of California for the Hon. Gonzalo P. Curiel. Alexander is also a co-founder of the National Trans Bar Association. He is a sought-after speaker who frequently addresses corporations, law firms, professional associations, conferences, and universities.